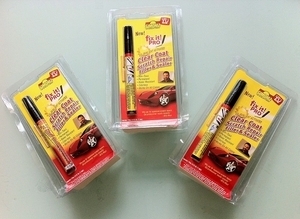 Enjoy BOS Buy Online Singapore's fantastic discounted prices when you buy this Fix It Pro Car Scratch Repair Pen set of 3 pack. 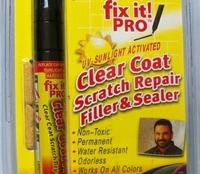 The Fixit Pro is a great product that will remove scratches on your car's clear coat paint. 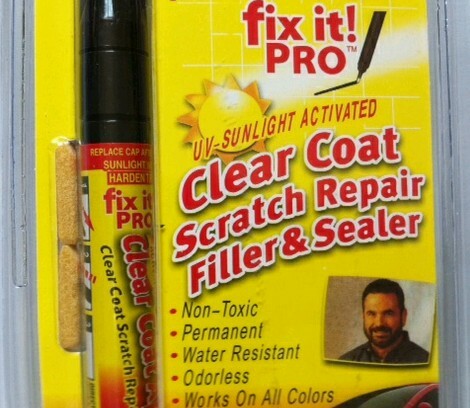 This is a clear-coat scratch repair pen, not a paint scratch repair pen. If your scratches are superficial, the Clear Coat Scratch Repair Pen will make the white clear coat scratch disappear - visually. The key to using this product is to follow the instructions closely. Most clear coat scratches that looks like white lines will no longer be visible with cursory examination. Do not push on the pen tip while you're repairing the scratch or you will release more material than you need. Its also very important to follow the instruction to only use the pen with your car in the shade (a basement or covered carpark is ideal), because the Fit It liquid will actually harden under the UV sunlight which is how seals the scratch permanently. Exposing the pen to sunlight will also increased the chance of the spring tip jamming as some of the liquid hardens. Step 1, Do this in the shade(I had an umbrella over be when I did mine). Step 2, press down on the about 30-40 time to get the Fix It liquid into the tip. Step 3, Still be in the shade when you apply it. Step 4, After appling it wipe off excess with a paper towel. Step 5, Move the car into the sun for it to harden.